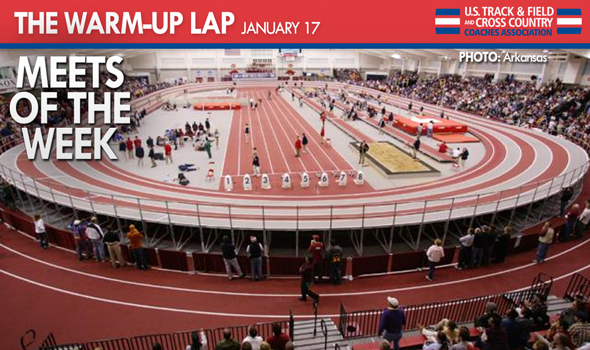 NEW ORLEANS – Now into the third full weekend of the 2014 portion of the indoor collegiate track & field season and the first with preseason National Team Computer Rankings, the hotspots of activity this weekend are becoming clearer with the USTFCCCA’s first Meets of the Week. A good ol’ fashioned dual meet headlines Division I when the top-ranked Arkansas men take on No. 15 Texas and the No. 1 Texas women square off against No. 7 Arkansas. Storylines abound in Arkansas with the Razorback men looking to defend their 2013 NCAA indoor title and the Longhorns debuting new head coach Mario Sategna and some new transfers including two-time national outdoor 400 meters champ Ashley Spencer. A GLIAC rivalry between Ashland, Findlay and Hillsdale makes for the Division II Meet of the Week, while some of Division II’s best will square off with Division III’s top teams at the Armory in NYC for the Ramapo College Indoor Select — DIII’s Meet of the Week. Also included within each Division’s preview is a look at some of its other top match-ups and an overview of where the top 10 men’s and women’s teams will be in action. (College Station, Texas) WEB: AggieAthletics.com LIVE NOW! (Reno, Nevada) WEB: UCSSpirit.com LIVE NOW! Friday, Jan. 17 | 7 p.m. ET | Meet Schedule | Fayetteville, Ark. When the No. 1 men’s team in the land — per the USTFCCCA National Team Computer Rankings — and the No. 1 women’s team are both under the same roof for one meet, it’s difficult to call anything else the meet of the week. Fayetteville, Ark., will be the site of such a scenario Friday as the Arkansas’ No. 1 men host No. 15 Texas and the No. 1 Texas women take on No. 7 Arkansas. The meet looks even better viewed through the lens of Track & Field News’ Dual Meet Rankings, in which Arkansas’ and Texas’ men are No. 1 and No. 2, respectively. On the women’s side, Texas is No. 2 while Arkansas is No. 4. Since this series began in 2010 as a showdown between the Arkansas and Texas men’s programs, the Razorbacks have claimed hard-fought victories in all four of the encounters. This year marks the first time the women have squared off against one another. High-profile Illinois transfer Ashley Spencer — the two-time defending outdoor 400 meters champion and an early-season favorite for The Bowerman Trophy — will be making her debut in Texas’ burnt orange at both 60 and 200 meters. Not only will this be the first big test for first-year Texas head coach Mario Sategna, it will indeed be his first track & field meet as the new head man in Austin. Meanwhile, this is just the first major hurdle on Arkansas men’s coach Chris Bucknam’s road to lead his team to a national title defense. The Northwest Ohio Invitational at Findlay on Friday will feature top-25 match-ups in both the men’s and women’s competitions as the No. 3 Ashland men and No. 4 Ashland women open up their 2014 schedules against the No. 6 Findlay and No. 24 Hillsdale men. The women’s competition is headlined by second-ranked women’s high jumper Jennifer Foster of Ashland and seventh-ranked pentathlete Pam Showman in the high jump, 60-meter hurdles, shot put and 500 meters. Three top-20 women’s teams headline the Ramapo College Indoor Select with No. 10 Wheaton (Mass. ), No. 17 Rowan and No. 20 Gwynedd-Mercy, while the men’s competition is anchored by No. 15 Christopher Newport. The nation’s top women’s 400 meters runner Ashante Little leads Wheaton’s squad, while Rowan is anchored by third-ranked women’s miler Vanessa Wright and seventh-ranked quarter-miler Brianna Crofton. Depending on the race assignments, Little and Crofton could square off against Gwynedd-Mercy sprinter Zakiyyah Richardson, ranked second in the nation at both 60 and 200 meters. Top-ranked heptathlete Richard Roethel — also fourth in the high jump nationally — headlines the Christopher Newport men’s squad. If the competition between these DIII schools wasn’t enough, they will get a chance to test their mettle against some of the best in Division II. Defending women’s national indoor and outdoor champion No. 10 Academy of Art leads a group of DII teams set to compete at the Armory including No. 12 New Haven and No. 18 Georgian Court — with National Athlete of the Week Tiffany Okieme. Christopher Newport’s men will be challenged by No. 8 Southern Connecticut and No. 10 Academy of Art.